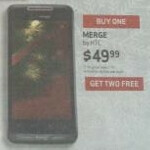 You might remember the HTC Merge that was supposed to launch on Verizon sometime last year. Originally discovered on Verizon's inventory system in August 2010, a picture of the device appeared the next month with the Bing search app instead of Google. Also called the HTC Lexicon, the World Phone was put through some benchmark tests where it scored a number of 1497 on the Quadrant Benchmark test, topping the score on the Nexus One running a similarly installed Android 2.2. Eventually, the device was expected to launch on November 11th 2010, which never happened. Instead, the phone became available for regional carriers Alltel (April 7, 2011) and U.S. Cellular (June 1st, 2011) earlier this year. Compared to today's dual-core smartphones, the HTC Merge is not a high spec'd device. With a single-core 800MHz processor (Qualcomm MSM7630) and 512MB of RAM, the phone was equipped with a 3.8 inch screen offering resolution of 480 x 800. HTC Sense runs on top of Android 2.2 and a 5MP camera on back captures video at 720p. For those who like the feel of a physical keyboard, the HTC Merge also has a side-sliding QWERTY. 2GB of native storage can be expanded using the microSD slot on the device. What brings back the name of Verizon's HTC Merge is a curious holiday ad in the local Greensboro, North Carolina newspaper. 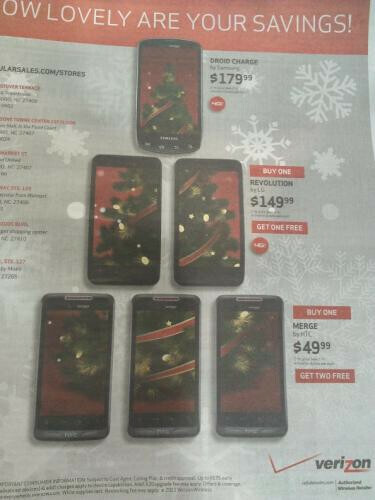 The ad, for Big Red, shows a pyramind of handsets with the Verizon variant of the Merge on the bottom, priced at $49.99 with a 2-year contract. If you really, really want this rare unicorn of a Verizon phone, you can buy one and get two free! Of course, you might need to unload the extra 2 units to make back some of your airfare to Greensboro and back home. Chilling with a unicorn and the tooth fairy? Most retailers have the nexus in stock already... I messed around with one today, it's beautiful. Although the razr is a great choice too! Nexus will be out before christmas forsure. 3 merges for $50 plus $100 off mailer. So 3 merges for free. Sold for $100 a piece=$300 for the nexus. So free nexus if you can find a buyer for the merges. Maybe a cellphone buyback program? I would assume each phone would need a 2 year contract. That would put those 3 free phones in your hands for about $195 per month. on vzw website if you search for HTC Merge ADR6325 you get some tips for it!!! Its coming out soon i guess? The HTC Rezound is a really good device... Battery is awesome.. which shocks me... the beats tech is really nice also... I didnt want another HTC either but i was beyond fed up with my Droid Charge.. Im waiting on the Droid Razr... Then one of the 2 will end up on eBay... LoL.. Okay seriously? Just say Christmas! that is what it is called. . . No one even says Xmas, like seriously, what's that even supposed to mean?